Other people helped you get where you are. Do that for someone else. Don’t wait for people to come to you. Opportunities slip away while you wait. Seek opportunities to help others see their power. You make a difference when you inspire others to make a difference. Ask people to tell their stories. Listen for achievements and frustrations. Successes illustrate competencies. Frustrations reveal unfulfilled passions. Invite people to talk about their aspirations. Spend less time talking about yourself and more time focused on others. Prepare to hear negatives before positives. When you ask people what they want, they tell you what they don’t want. Don’t get sucked into the black hole. Complaints are the underbelly of opportunities. Ask questions that explore self-limiting beliefs. Remind people of their aspirations. (See #2.) People give up on themselves. Believe in others, even when they lose hope. 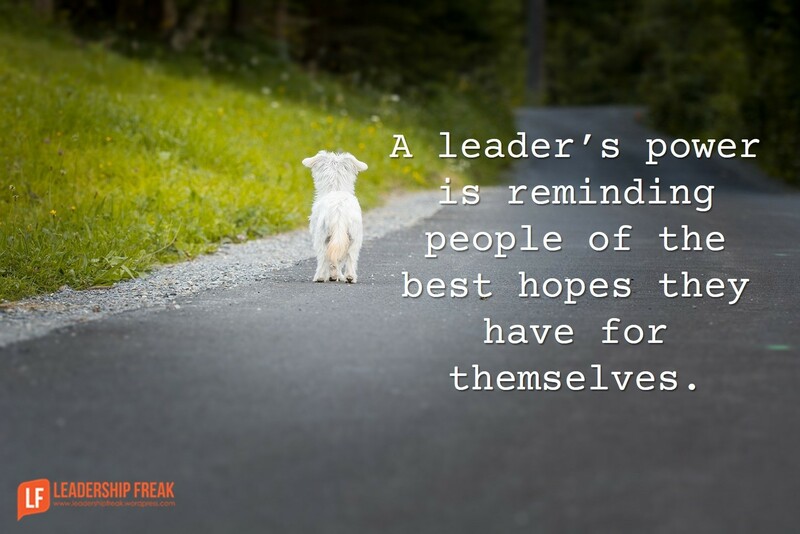 A leader’s power is reminding people of the best hopes they have for themselves. Carve away at the elephant until you have a small slice on your plate. Leadership is always about next steps. You aren’t leading until someone is excited to take the next step. Look for something small and quickly achievable. The path to big opportunities is paved by grabbing small possibilities. Bonus: Help people try something new. Don’t do it for them! One way to matter more is by doing something you’ve never done. Never let distant uncertainties block the pursuit of near certainties. How might you make a bigger difference in the world today? Great “original” advice. . . I get the feeling that your “wheels” are always turning. Thank you. I enjoy your emails. I love the transformational conversations that compliment to transformational leader! Dan, Excellent as always, for me it has been commit a random act of kindness everyday, my Mother has always said ” do something nice for someone everyday”. That being said we can do that as Leaders too! Tomorrow I have a transformation I need to commence, means reassigning someone from their current team leadership role to a technical leadership role. It will suit their strengths better and, with some coaching/training, it will show the value they bring to the organisation. Today’s blog will be useful in structuring the conversation so it is framed as positive and future focussed – as opposed to the obvious loss of face and low self esteem that people can quickly move to. Don’t wait for opportunities…trying my best to live that now and what we begin to notice is those that do wait. It is so revealing to see the stark contrast between the frustration that comes with wait and the freedom and positivity that comes with seeking opportunity. It gives us energy when we can make a connection and impact someone else, when they did not expect it. It also lets that person know that we are here for them to support and assist by listening, affirming and recognizing their efforts. Leadership! These eight tips really advocate for social change by addressing the problem in digestible steps. I think if every leader makes a habit of practicing each of these tips, they will improve his/her relationship with their colleagues. I think leaders need leadership coaches in order to practice using this language with scenarios until their conversations become natural.This is also a great way to model for them the expectations of service to others and being a true humanitarian. Thank you!